Polish angler Piotr and two friends arrived at Palm Tree Lagoon in the early afternoon directly from the airport. On arrival the anglers ate a delicious Thai meal before starting their days fishing. With several rods cast to various areas of the lake the anglers did not have to wait long for action. One of the predator rods was first to burst into action as an unseen predator tore off wth the bait. A short but spirited battle followed which saw a decent Asian Redtail Catfish being landed several minutes later. The catfish was quickly photographed before being returned back to the lake. 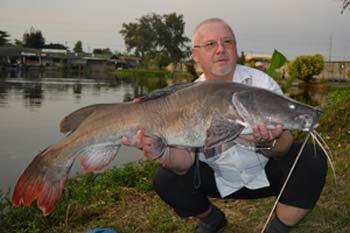 Further casts with the carp and catfish rods saw all the anglers catching Striped Catfish ranging between 15-20kg’s. As the afternoon continued the anglers enjoyed sporadic bursts of action with several decent sized Amazon Redtail Catfish also being landed on dead bait tactics in addition to yet more Striped Catfish and a bonus Tambaqui. With jet lag taking its toll the anglers retreated to the comfort of the nearby hotel for a much needed rest in readiness for the next days fishing at Palm Tree Lagoon.